Certain roofs seem to last longer. Why is that? There are several reasons one person’s roof stays in good shape while another person’s roof needs repairs or replacement sooner than later. For starters, if your roof is near leafy trees, you’ll probably notice the leaves end up discoloring your shingles over time. Moss and other stuff may end up growing on roofs where wet leaves congregate over time. One solution to keeping your roof in good shape is to have any trees close to the house cut down or at least trimmed so their branches and leaves don’t interfere with the roof’s overall well-being. Imagine a giant branch overhanging onto your roof, hitting it every time the wind blows– that’s bound to do some damage, right? If tree leaves and branches don’t mess with your roof, then water’s another potential problem that could cause you to need a whole new roof. Water needs to be whisked away off the roof rather than linger there. Your downspouts and gutters need to be working properly at all times, including during cold, icy winters, in order for your roof to function at its best. Anytime water accumulates on a roof, that’s not a good thing! While you may feel you can see your roof from down below, the reality is that it’s better to have a professional climb up there once a year or so and take a look around, seeing if there are any problems or potential problems, such as a raccoon making a nest up there or some missing shingles you cannot see from down below. 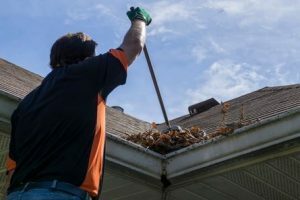 People who have their roofs checked by a professional on an annual or semi-annual basis are bound to have roofs that stay in good shape over the years simply because they’re being checked instead of forgotten. Finally, ventilation is truly key if you want to maintain a good roof over time. For instance, if you notice cracking or curling of shingles, then something’s amiss with your ventilation. Want to have Roofing by Bruce come and inspect your roof to assess how it’s currently doing and whether or not it’ll need repairs or replacing anytime soon? Please call Roofing by Bruce today at 570-424-7250.